My buddy Shelly Lutz told me when he was single a man over thirty years ago, he only needed to know how to cook two meals to win a woman over. “Dinner and breakfast?” I asked. This past Saturday night I cooked dinner for a friend. I was in the mood for a “splurge/cheat” night, and she wanted some comfort food as her dog was sick at the vet. I decided to make fettuccini Alfredo. In college, while reading GQ Magazine, I came across the recipe from Alfredo’s in Rome, originator of the dish. Since I was not blessed with looks or a developed sense of humor growing up, I relied heavily on cooking to make myself datable. As of today, everyone has fallen in love with this recipe, including my daughter Jordyn. Normally, I go to the store and buy dried pasta, cream, butter and parmesan. Nothing special. I just get what they carry. I decided to do a little experiment. What if I were to drive all over town and get the “best” of each ingredient? I went to Lazzaroli’s Pasta Shop in Germantown. They make all of their pasta fresh and sell it in bulk. The fettuccini noodles were a golden yellow from the egg yolks. They carried Irish butter, which I have always heard is a better butter. I ran over to Whole Foods to get about a half pound chunk of Parmigianino regamano cheese, the real stuff, and a pint of cream from Hatcher’s Dairy. Hatcher’s is a local, family owned dairy. They handle everything from milking to marketing and offer a premium product. 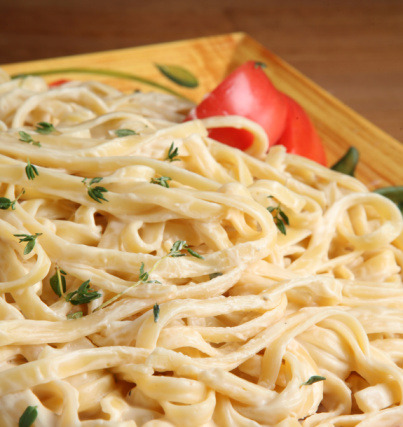 The combination of all these premium ingredients made for the most incredible fettuccini Alfredo ever! I would put it up against any restaurant. I’m salivating thinking about it now. Are there lots of people who shop on price? Yes. Is price the only thing that matters? No. If everyone cared about price, Wal-Mart would be the only retail store. Sam’s Club would be the only gas station. Obviously, my cooking expedition is a small example of someone willing to pay a premium price for premium ingredients (or service). If you are attracting cheapskates, use different bait (make yourself better) or cast your net for different fish. Your job is to position your catering as a great value. There are many factors: price, serving size, quality, reputation, guarantee, service level, staff quality, etc. Your first job is to know your competitors better than yourself. Call and play prospect. Eat at their restaurants. Get a copy of their menu. Discover how much food they give in each package. How’s it cooked (fresh or reheated)? Order a small catering order. Analyze everything from the initial phone call and inquire about what happens when the food is dropped off. I have a local client who was worried about a low price competitor. I knew first hand the low quality of his competitor’s product. I told him for larger events, show up with a sample of your product and his (boxed without labels). Let the customer pick which is better. Now this was an easy way to neutralize price. Your job is to compare apples to oranges. When a client says, “We can get it for a dollar less over here,” your job is to challenge them in a respectful manner. I literally could spend all day writing out sample scripts on this. The only way to win a war or a football game is to study your opponent. Know them better than you know yourself. Then use that information against them. Your job is to uncover the chinks in their armor and eliminate yours. At the end of the day, you will be in a situation that requires a lower price…like getting an event for a thousand. Resist the urge to discount. Add value. Throw in drinks, desserts, maybe even some gift certificates as a rebate or for door prizes. Your ability to command a high price begins with your self-confidence in what a great value you provide. Note. I said great value, not great price.